A pale blue, jasper dip, campana vase. 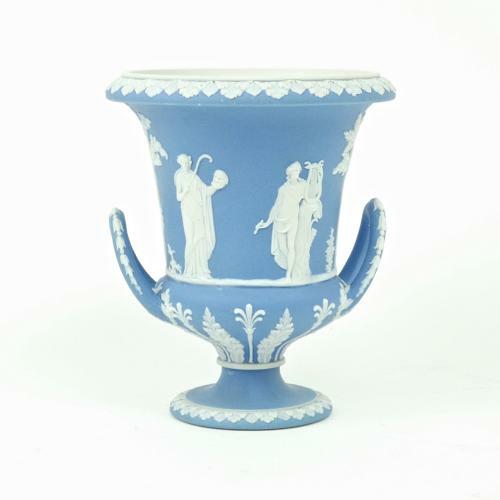 This piece has the impressed marks 'WEDGWOOD' and the letters 'WUS'. This is the three letter date code for the year 1864. It also has a separate, impressed letter 'S' and an incised number '43'. It is decorated with Apollo and three of the Muses standing between trees. There are various foliate bands beneath the figures and also to the foot and the rim. All of the reliefs are very good quality. Originally this vase would have had a domed lid but this is now missing. However, it is still a very decorative vase and it is in excellent condition. Price includes postage with the U.K. Shipping to the U.S.A. add £25. Western Europe add £10.